Climate change presents urban areas in Africa with significant challenges relating to adaptation to dynamic climate risks and protection of critical infrastructure systems and residents’ livelihoods. 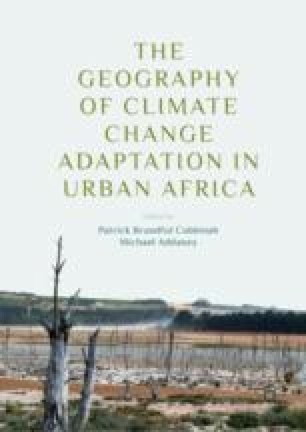 This chapter argues for the need to adopt multidisciplinary approaches, perspectives and theoretical frameworks that espouse the transformation of climate change adaptation options and sustainable urban environmental management practices in Africa. It also brings together key findings from the various chapters of the book underscoring the geographical variations, future challenges and opportunities for urban planning and climate change adaptation in Africa. It emphasises lessons learned from specific case studies can be useful to identify best practices which can be applied more widely and poor practices which need to be re-examined. Future research needs are also highlighted. Africa Growth Initiative (AGI). (2017). Foresight Africa: Top Priorities for the Continent in 2017. Retrieved from https://www.brookings.edu/wp-content/uploads/2017/01/global_20170109_foresight_africa.pdf. Ijjasz-Vasquez, E., & White, R. (2017). When It Comes to Developing Africa’s Cities, “Grow Dirty Now, Clean Up Later” Is Not an Option. Retrieved from http://blogs.worldbank.org/sustainablecities/when-it-comes-developing-africa-s-cities-grow-dirty-now-clean-later-not-option. IPCC. (2018). An IPCC Special Report on the Impacts of Global Warming of 1.5 °C above Pre-Industrial Levels and Related Global Greenhouse Gas Emission Pathways, in the Context of Strengthening the Global Response to the Threat of Climate Change, Sustainable Development and Efforts to Eradicate Poverty: Summary for Policymakers (Geneva: IPCC). Retrieved from http://ipcc.ch/report/sr15/. Naa Lamiley Bentil, N. A. (2017, June 1). Greening Africa’s Cities to Protect People and Growth. Daily Graphic. Retrieved from http://www.graphic.com.gh/international/africa/greening-africa-s-cities-to-protect-people-and-growth.html. Schellnhuber, H. J. (2013). Turn Down the Heat: Climate Extremes, Regional Impacts, and The Case for Resilience. A Report for the World Bank by the Potsdam Institute for Climate Impact Research and Climate Analytics. Retrieved from http://www.worldbank.org/content/dam/Worldbank/document/Full_Report_Vol_2_Turn_Down_The_Heat_%20Climate_Extremes_Regional_Impacts_Case_for_Resilience_Print%20version_FINAL.pdf. UN. (2015). The Sustainable Development Agenda. Retrieved from http://www.un.org/sustainabledevelopment/cities/. UN. (2018). World Urbanization Prospects: The 2018 revision. Retrived from https://population.un.org/wup/Publications/Files/WUP2018-KeyFacts.pdf. UN Habit. (2015). Sustainable Urban Development in Africa. Retrived from https://unhabitat.org/sustainable-urban-development-in-africa/. UN Sustainable Development Goals. 2015. Retrieved from https://sustainabledevelopment.un.org/?menu=1300. White, R., & Ijjasz-Vasquez, E. (2017). Greening Africa’s Cities to Protect People and Growth. The World Bank Group. Retrieved from http://www.worldbank.org/en/news/press-release/2017/06/01/greening-africas-cities-to-protect-people-and-growth. World Bank. (2014a). African Cities: Stronger Local Capital Markets Needed to Finance Sustainable Development. Retrieved http://www.worldbank.org/en/news/feature/2014/04/18/africa-local-capital-markets-to-finance-sustainable-development. World Bank. (2014b). Population Living in Slums (% of Urban Population). Washington, DC: The World Bank Group. Retrieved from https://data.worldbank.org/indicator/EN.POP.SLUM.UR.ZS. World Bank. (2018). United Nations, World Urbanization Prospects: Population in Urban Agglomerations of More Than 1 million (% of Total Population). Washington, DC: The World Bank. Retrieved from https://data.worldbank.org/indicator/EN.URB.MCTY.TL.ZS?view=chart.